alaTest has collected and analyzed 1618 reviews of Apple iMac 27-inch Retina 5K, Mid & Late 2015 (MK462, MK472, MK482, MF885, Z0QW). The average rating for this product is 4.7/5, compared to an average rating of 4.2/5 for other Desktops for all reviews. Comments about the reliability and size are generally positive. The design and usability are also appreciated. Many are critical about the price. We analyzed user and expert ratings, product age and more factors. Compared to other Desktops the Apple iMac 27-inch Retina 5K, Mid & Late 2015 (MK462, MK472, MK482, MF885, Z0QW) is awarded an overall alaScore™ of 96/100 = Excellent quality. alaTest has collected and analyzed 10 user reviews of Apple iMac 27-inch Retina 5K, Mid & Late 2015 (MK462, MK472, MK482, MF885, Z0QW) from Amazon.co.uk. The average user rating for this product is 4.9/5, compared to an average user rating of 4.2/5 for other Desktops on Amazon.co.uk. Views about the reliability and design are overall positive, whereas there are some mixed comments about the price. Some have doubts about the size. alaTest has collected and analyzed 132 user reviews of Apple iMac 27-inch Retina 5K, Mid & Late 2015 (MK462, MK472, MK482, MF885, Z0QW) from Amazon.com. The average user rating for this product is 4.1/5, compared to an average user rating of 4.0/5 for other Desktops on Amazon.com. People are impressed by the size. The design is also mentioned favorably, whereas the price and reliability get less positive views. The latest iteration of the Apple iMac with Retina 5K Display delivers 14.7 million pixels in a very sleek package to your desktop, and it's more affordable than ever. 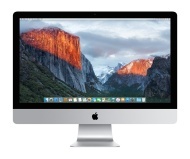 The iMac with 5K Retina display now starts at $1,999, but keeps last year's CPUs. Just when you thought it was safe to get comfortable with the look and language of 4K, Apple comes along and adds what the company is calling a 5K display in the premium 27-inch iMac all-in-one desktop. Brilliant 27-inch 5K display brings Retina to the iMac. High-end performance for video and photo editing. Fusion Drive comes standard. Loses the monitor functionality of other iMacs. Upgrades limited to adding RAM. Lacks height adjustment. Rear-mounted ports aren't convenient. Looking sharp. Last year, Last year, Apple presented us with the first iMac with a Retina display. Equipped with a desktop CPU and a mobile graphics card, this machine, that represents the apex of performance, is now ours to scale and lay bare. The late-2015 iMac's competitive pricing and outstanding 5K display will make it a very tempting option for creative professionals such as video editors.